The Regional Song, and Dance Group "Kaszuby" ot the town of Kartuzy is an amateur group. It was founded in 1946 by Marta Bistroń and up to this day its task has been to make the riches of the Kashubian folklore as popular as possible. Since the day of its first performance on stage the Group has taken part in all kinds of festivals, shows and ceremonies in Poland and abroad. One of those early appearances of the Group was to commemorate the first anniversary of the liberation of Gdańsk in 1946. Then the Group gave performances at the 3rd and 5th All-Polish Folk Song Festivals of the Lands-on-the-Vistula in Płock at the Folk Music-and-Song Festivals in Poznań and in Kazimierz nad Wisłą. It also sang and danced during the Retrived Lands Exhibition in Wrocław and at the Youth Rally in Warsaw's Łazienki. The Group took part in all national Harvest Festivals which have been organized since 1949 in such towns. The Group also presented itself once in such as countries as Finland, Belgium, Austria, Luxemburg, Latvia, Russia, Spain, Switzerland, Romania, Slovakia, Andorra, Bosnia and Herzegovina, Croatia, Macedonia, Serbia, Norway, Egypt, Turkry, Tunisia, England and Italy where it won the 5th position at the World Festival of Song-and-Dance Groups in Pescara. Apart from regular on-stage shows, the Group also sang and danced in films such as "Kaszebe" /The Kashubians/, „Noc Świętojańska" /"The Night of St. John"/, „Jadą Gwiżdże" /"The Gwiżdże are coming"/, „Dyngus" /„Wet Easter Monday"/, „Scena Rybacka i Chrztu" /Fishermen»s Christening"/ and „Ścinanie kani" /"The Beheading of the Kite"/. Large audiences could also watch the „Kaszuby" Group perform on the TV and listen to their singing in the radio. The Group also scored great successes in numerous competitions all over Poland. It won first prizes in the folk song chorus contests in Olsztyn, Warsaw and Gdańsk. 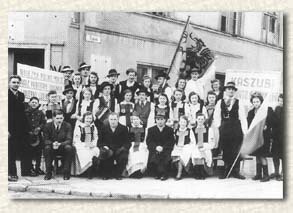 At the All-Polish Festival of Folk Music Groups and Singers in Kazimierz, the „Kaszuby" won the 3rd prize twice. It also won first prizes at four consecutive Kashubian Folk Group Festivals in Chojnice, as well as at the 1st, 7th and 1 Oth Festival of Folklore Groups of Northern Poland in Gdańsk. At other regional festivals the „Kaszuby" were always among the best. In acknowledgment of their artistic achievement, the „Kaszuby" have been given several awards, diplomas and other marks of appreciation such as the Golden Order of Merit, the medal to commemorate the Thousandth Anniversary of the Polish State, The Stolem Medal, The Medal of Contribution to the Region of Gdańsk. The „Kaszuby" were also distinguished twice by being awarded the second special prize of the Ministry of Culture and Arts. The Group has performed in almost every city of Poland. Its repertoire consists exlusively of songs, dances and melodies which originate in the region of Kashubia. The performances show the customs connected with the celebrating of the New Year /masquerades/, of the Night of St. John; they also present sequences of Kashubian dances and medleys of sketches and songs. The „Kaszuby" were the first who introduced old folk musical instruments to the band: „bazuny", „burczybasy" and „diabelskie skrzypce" /"devil»s fiddle"/. Since 1961 the Group has been managed by Franciszek Kwidziński who was in the „Kaszuby" since 1952. He is also the dance instructor since 1985. . The manager, the instructors and all the performing artists work for the Group in their spare time only as amateurs. The Group consists of 50 persons, aged from 16 to 70.